Studio portraits of women and children from this era usually survive in family albums until they can no longer be remembered or identified by subsequent generations of the family. The people in each of these portraits have yet to be named and the provenance prior to purchase on eBay of each item is unknown. Above: A full-length studio carte-de-visite portrait of a fair-haired four year old child, possibly a girl, wearing a frock coat and frilly bloomers, her gaze direct to camera. In her right hand she holds a card, her left hand rests on the arm of a low chair where a white hat is placed. The verso carries Alfred Bock’s studio stamp with the kangaroo emblem sitting on top of a small leather belt encompassing the initials “A.B”. 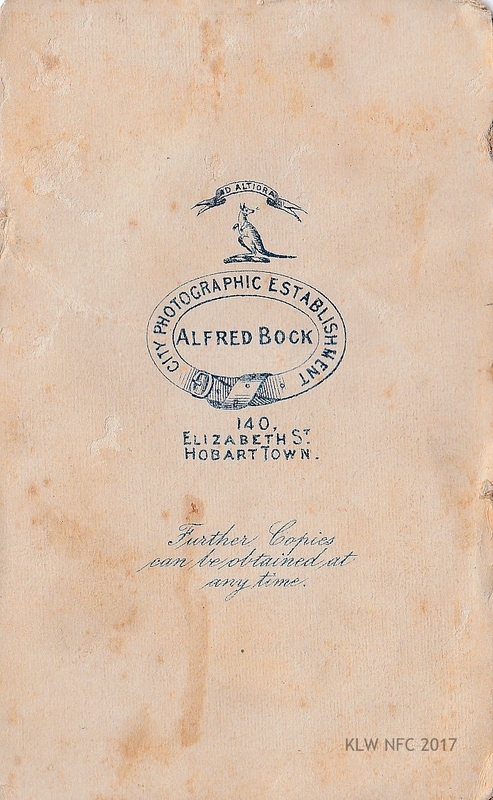 The wording of the stamp is ” Alfred Bock, City Photographic Establishment, 140 Elizabeth St. Hobart Town”. The stamp design dates from 1858 when Bock first moved to the studio at 140 Elizabeth St. and predates his later stamp of 1865-1867 (see second cdv below) which Thomas J. Nevin modified on acquiring the business in 1867. 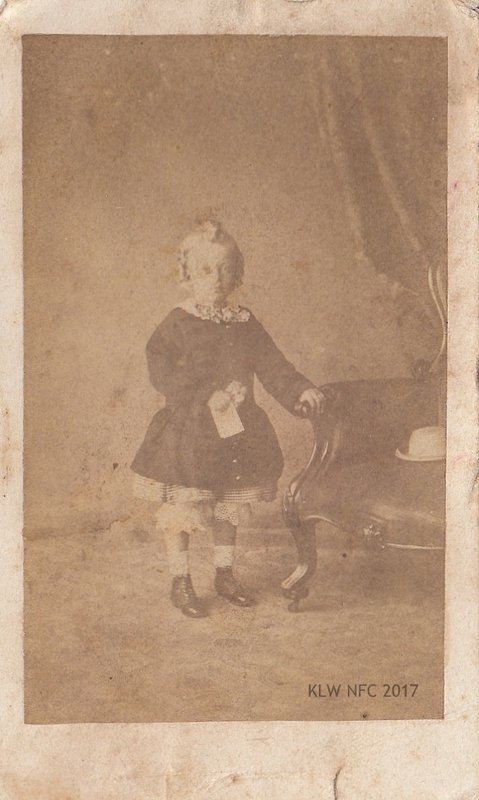 Full-length studio carte-de-visite portrait of a fair-haired four year old child, possibly a girl, wearing a frock coat and frilly bloomers, her gaze direct to camera. In her right hand she holds a card, her left hand rests on the arm of a low chair where a white hat is placed. The verso carries Alfred Bock’s studio stamp with the kangaroo emblem sitting on top of a small leather belt encompassing the initials “A.B”. 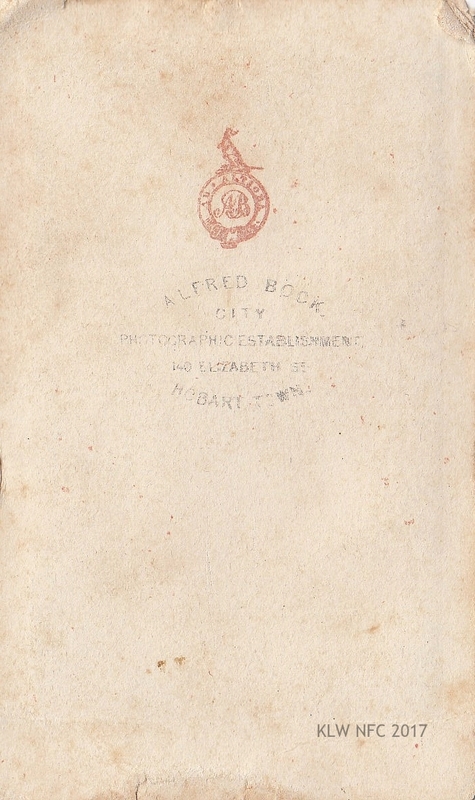 The wording of the stamp is ” Alfred Bock, City Photographic Establishment, 140 Elizabeth St. Hobart Town”. 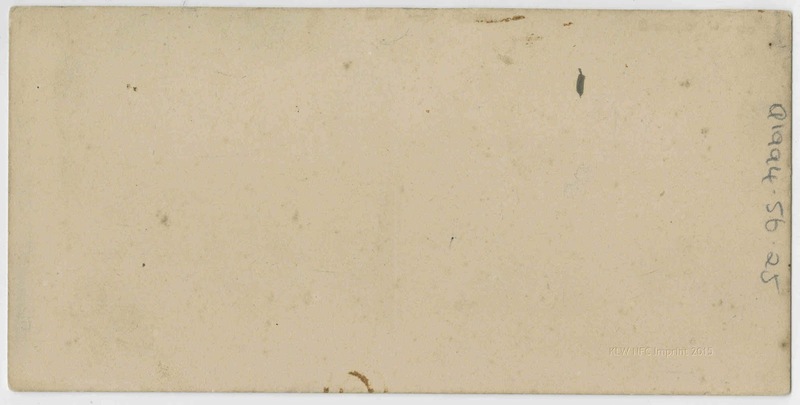 The stamp design dates from 1858 when Bock first moved to the studio at 140 Elizabeth St. and predates his later stamp of 1865-1867 (see second cdv below) which Thomas J. Nevin modified on acquiring the business in 1867. Above: A full-length studio carte-de-visite portrait of a woman in her thirties wearing a taffeta dress with a white collar and buttoned bodice, her gaze directed to the viewer’s right. She is standing with her left hand resting on an elaborately decorated plinth on which sits a metal fruit stand. Behind her to the viewer’s left is the heavy floral-patterned drape featured in many of Bock’s later studio portraits taken in Hobart between 1865 and his departure from Tasmania in 1867. The verso carries the stamp in blue ink with the kangaroo emblem sitting on top of a leather belt. Above the kangaroo inside a ribbon strip is the motto in Latin “Ad Altiora” – which translates as something like “to the heights” – and inside the circular belt design is his business name – “The City Photographic Establishment” – which in turn encompasses the studio address – 140 Elizabeth St. Hobart Town. Below this in italics is the promise that “Further Copies can be obtained at any time”. Thomas J. Nevin retained this stamp design on acquiring Bock’s stock, studio, glasshouse, and business name in 1867, adding his name and “Late A. Bock” inside the belt. 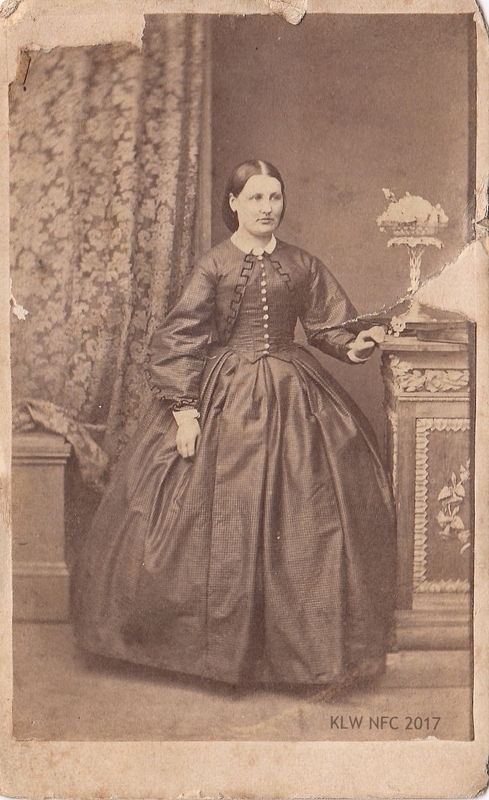 Full-length studio carte-de-visite portrait of a woman in her thirties wearing a taffeta dress with a white collar and buttoned bodice, her gaze directed to the viewer’s right. She is standing with her left hand resting on an elaborately decorated plinth on which sits a metal fruit stand. 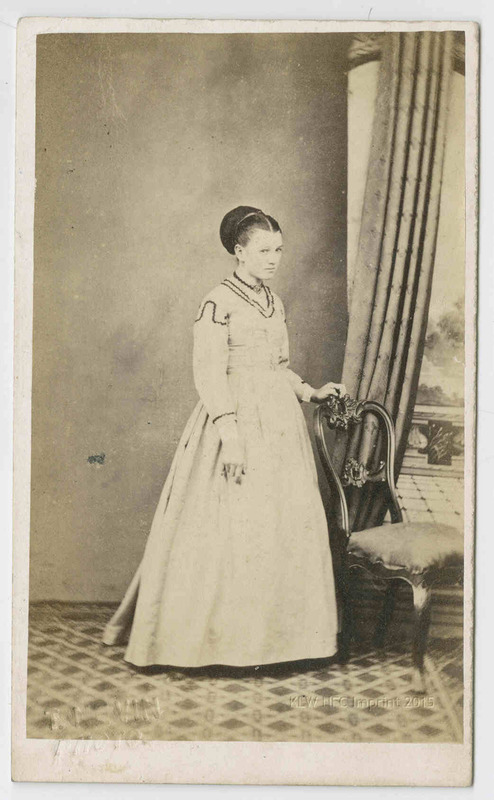 Behind her to the viewer’s left is the heavy floral-patterned drape featured in many of Bock’s later studio portraits taken in Hobart between 1865 and his departure from Tasmania in 1867. The verso carries the stamp in blue ink with the kangaroo emblem sitting on top of a leather belt. Above the kangaroo inside a ribbon strip is the motto in Latin “Ad Altiora” – which translates as something like “to the heights” – and inside the circular belt design is his business name – “The City Photographic Establishment” – which in turn encompasses the studio address – 140 Elizabeth St. Hobart Town. Below this in italics is the promise that “Further Copies can be obtained at any time”. Thomas J. Nevin retained this stamp design on acquiring Bock’s stock, studio, glasshouse, and business name in 1867, adding his name and “Late A. Bock” inside the belt. Above: a full-length studio portrait of a woman seated in a voluminous dress with white collar and cuffs, a long thin chain reaching from around her neck to her lap. Her hair is parted centre and coiled at the back. She is holding a five year old boy who is leaning against her knee, her gaze direct to camera. The boy wears a trouser suit and holds a toy – a stick on wheels or possible cotton reels – in his right hand, his gaze directed across to the photographer’s right. The studio decor features a floor to ceiling window with a backdrop painted with a patio scene. The verso is printed in lavender ink and very elaborately decorated with birds, branches and flowers. Included at the top is a stamp encircled in a wreath with the wording “1862 Londini Honoris Causa” and below that at centre is the Royal Arms insignia and the wording “C. Nettleton Photographer by Special Appointment to H. R. H. The Duke of Edinburgh” flanked on either side with Nettleton’s many medals won at London (1862) and Melbourne (1867) exhibitions. 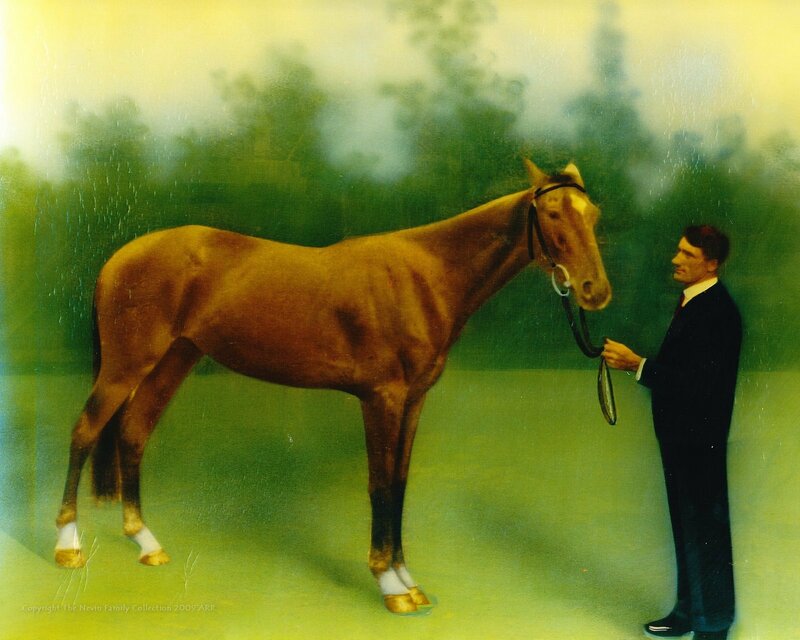 When this portrait was taken, his business address was No. 1, Madeline St. North Melbourne where he remained from 1863 until the late 1880s, although he had three other studios in Melbourne, including an office in the Victoria Arcade, Bourke St (Kerr 1992: 568). This portrait probably dates from the visit by the Duke of Edinburgh in 1868 up to the early 1870s. 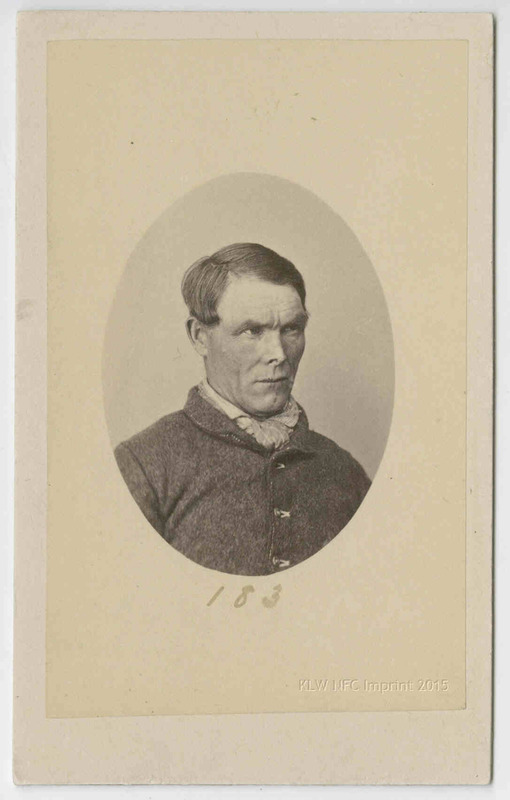 Charles Nettleton, like Thomas J. Nevin in Tasmania, provided the Victorian police and prison administration with prisoner mugshots for more than two decades. 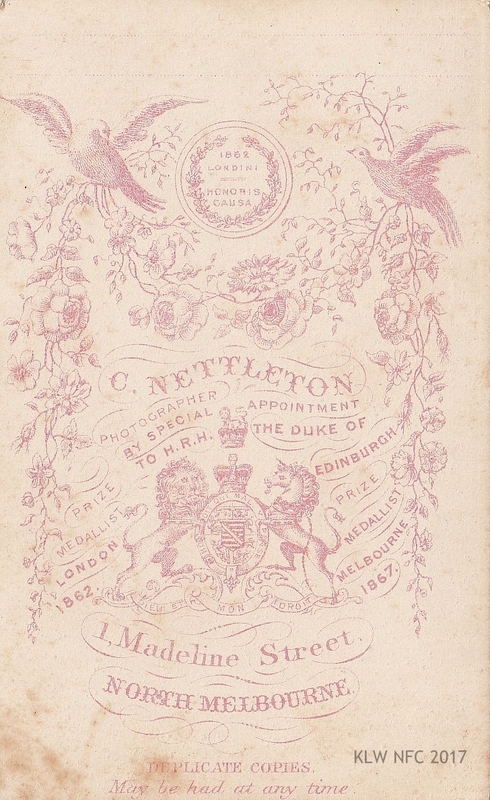 Photographer’s stamp verso: C. Nettleton, North Melbourne ca. 1869 A full-length studio portrait of a woman seated in a voluminous dress with white collar and cuffs, a long thin chain reaching from around her neck to her lap. Her hair is parted centre and coiled at the back. 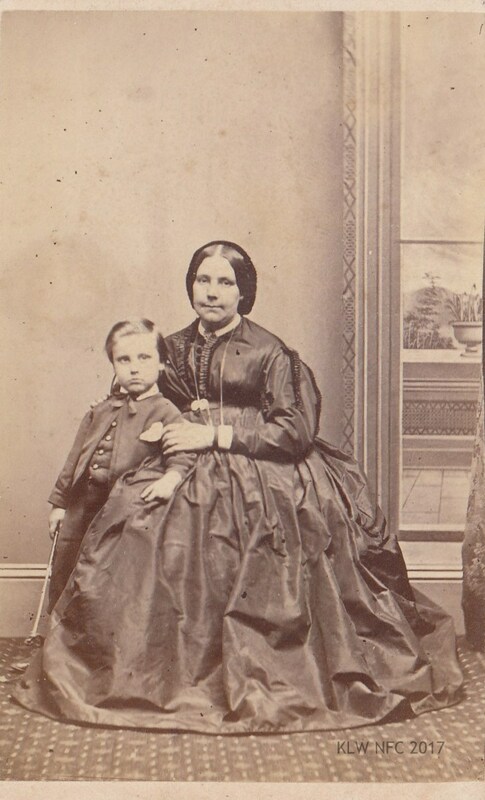 She is holding a five year old boy who is leaning against her knee, her gaze direct to camera. The boy wears a trouser suit and holds a toy – a stick on wheels or possible cotton reels – in his right hand, his gaze directed across to the photographer’s right. The studio decor features a floor to ceiling window with a backdrop painted with a patio scene. The verso is printed in lavender ink and very elaborately decorated with birds, branches and flowers. Included at the top is a stamp encircled in a wreath with the wording “1862 Londini Honoris Causa” and below that at centre is the Royal Arms insignia and the wording “C. Nettleton Photographer by Special Appointment to H. R. H. The Duke of Edinburgh” flanked on either side with Nettleton’s many medals won at London (1862) and Melbourne (1867) exhibitions. When this portrait was taken, his business address was No. 1, Madeline St. North Melbourne where he remained from 1863 until the late 1880s, although he had three other studios in Melbourne, including an office in the Victoria Arcade, Bourke St (Kerr 1992: 568). This portrait probably dates from the visit by the Duke of Edinburgh in 1868 up to the early 1870s. 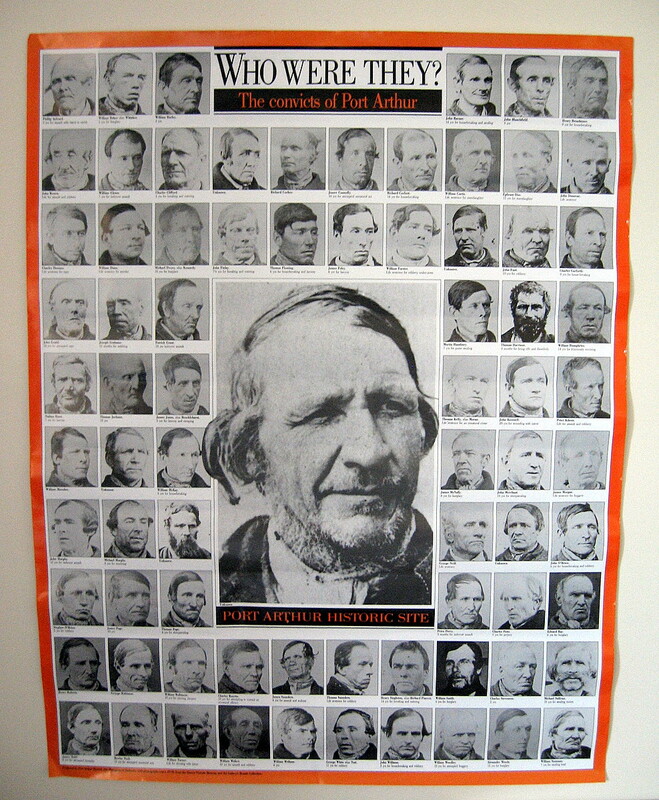 Charles Nettleton, like Thomas J. Nevin in Tasmania, provided the Victorian police and prison administration with prisoner mugshots for more than two decades. Above: a full-length carte-de-visite studio portrait of a young girl, possibly nine years old wearing a dark dress with a white collar and braiding along the sleeve, showing the lace of her bloomers at the hem against her bare legs. Spats cover her shoes. Her hair hangs loose in ringlets, and her gaze is slightly dropped and held steady to the viewer’s left. The studio decor includes an occasional table on wheels to the viewer’s right of frame on which sits a book, and a dining chair on the left on which the child rests her right arm. In her left hand she holds a thickly folded card. 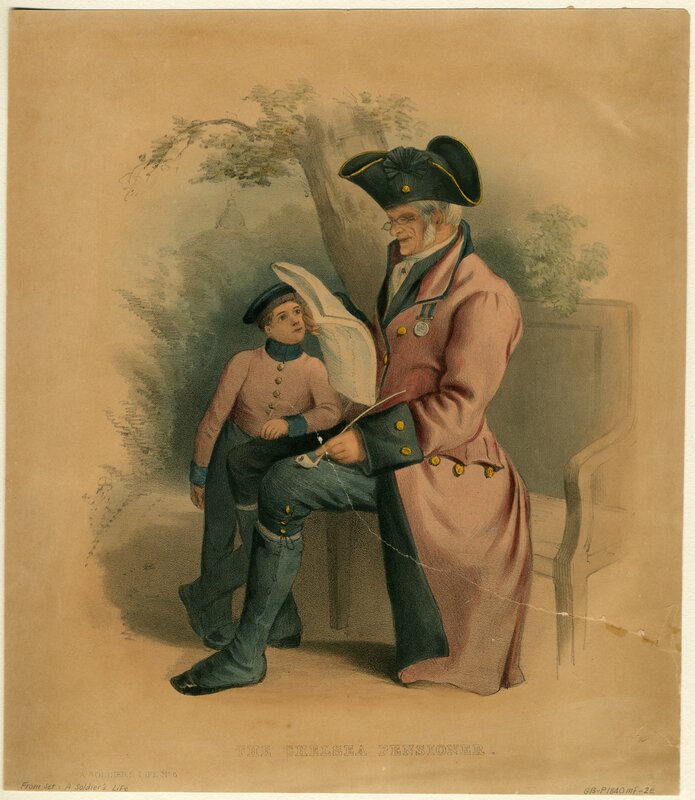 Charles Woolley’s signature technique was to produce prints in rich dark tones which made his portraits especially appealing. The verso bears Woolley’s “Advance Tasmania” studio stamp with emu and kangaroo animal iconography flanking the Tasmanian colonial insignia. His studio address for more than two decades was 42 Macquarie St. Hobart where he also ran a furniture business with his father. 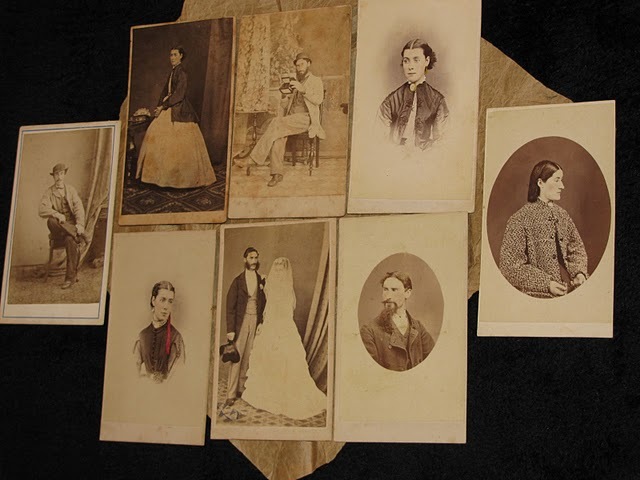 He must have supplied furniture, carpets and wall-hangings to all the Hobart photographic studios during the 1860s, and even sold items from his own studio when he ceased professional practice in the 1870s, because the same items appear in different photographers’ studio portraits. Photographer’s stamp verso: Chas A. Woolley, Hobart ca. late 1860s. Full-length carte-de-visite studio portrait of a young girl, possibly nine years old wearing a dark dress with a white collar and braiding along the sleeve, showing the lace of her bloomers at the hem against her bare legs. Spats cover her shoes. Her hair hangs loose in ringlets, and her gaze is slightly dropped and held steady to the viewer’s left. 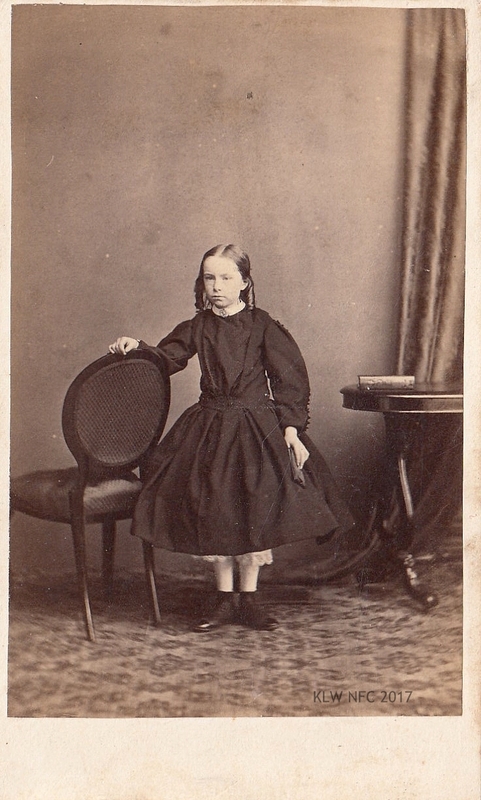 The studio decor includes an occasional table on wheels to the viewer’s right of frame on which sits a book, and a dining chair on the left on which the child rests her right arm. In her left hand she holds a thickly folded card. Charles A. Woolley’s signature technique was to produce prints in rich dark sepia tones which made his portraits especially appealing. 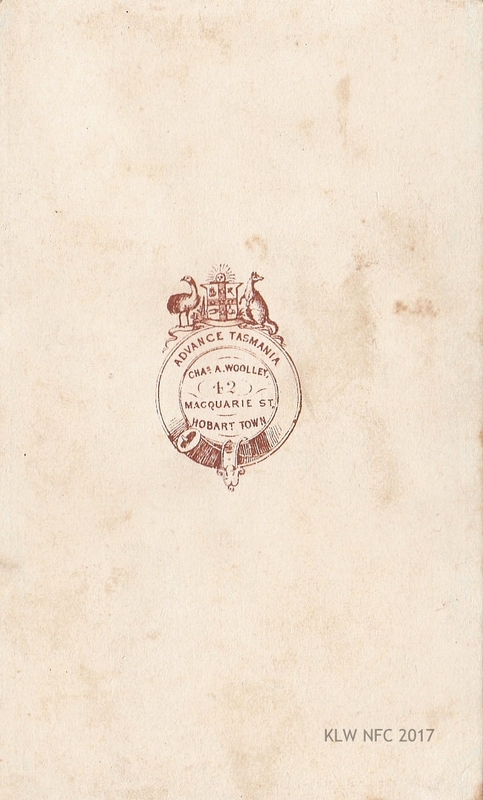 The verso bears Woolley’s “Advance Tasmania” studio stamp with emu and kangaroo animal iconography flanking the Tasmanian colonial insignia. His studio address for more than two decades was 42 Macquarie St. Hobart where he also ran a furniture business with his father. 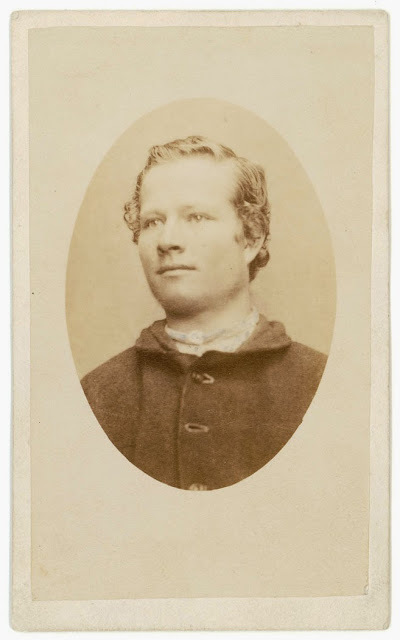 He must have supplied furniture, carpets and wall-hangings to all the Hobart photographic studios during the 1860s, and even sold items from his own studio when he ceased professional practice in the 1870s, because the same items appear in different photographers’ studio portraits. 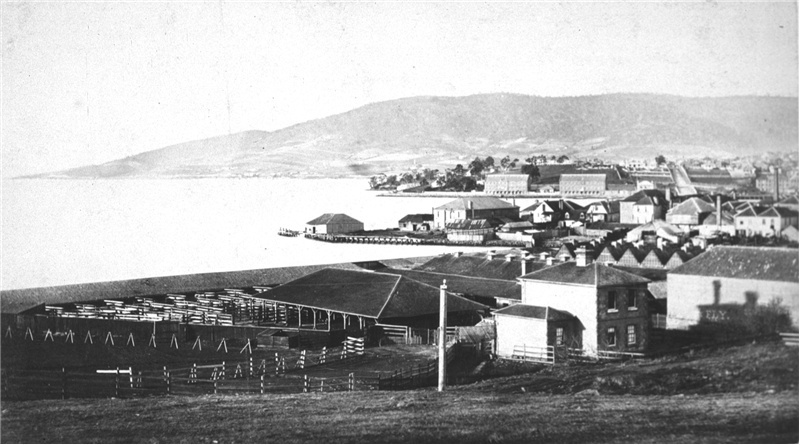 With the departure of Thomas Nevin’s senior partner Alfred Bock to Sale, Victoria in 1867, and then the departure of Robert Smith to Goulburn, NSW in 1868 after his brief partnership with Nevin while operating as the firm Nevin & Smith at the former premises of Alfred Bock, the City Photographic Establishment, 140 Elizabeth Street, Hobart, Thomas Nevin’s closest relationship as both a business partner and personal friend was with the prolific stereographer Samuel Clifford. Many of Clifford’s and Nevin’s stereographs – and they produced thousands between them from the late 1860s to the early 1870s – are identical. Above: two images which differ slightly – i.e. the image on the right includes a little more of the landscape on its left border than the image on the left. Captured with a stereoscopic camera perhaps, or with a single camera moved slightly for the second capture, and mounted for viewing through a stereographic viewer in a double-arched frame on yellow card. 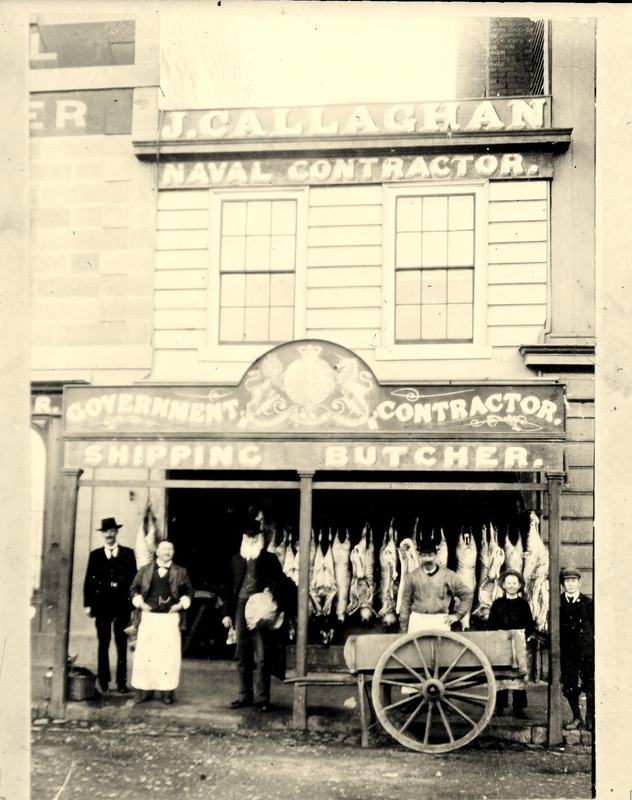 The subject shows mercantile success: five merchant traders – probably three-masted barques – lined up port side along New Wharf (now Salamanca Place) Hobart. Crates and and timber (deal) are visible on the wharf. Two horse and cart carriers wait in the street pointing towards the town. 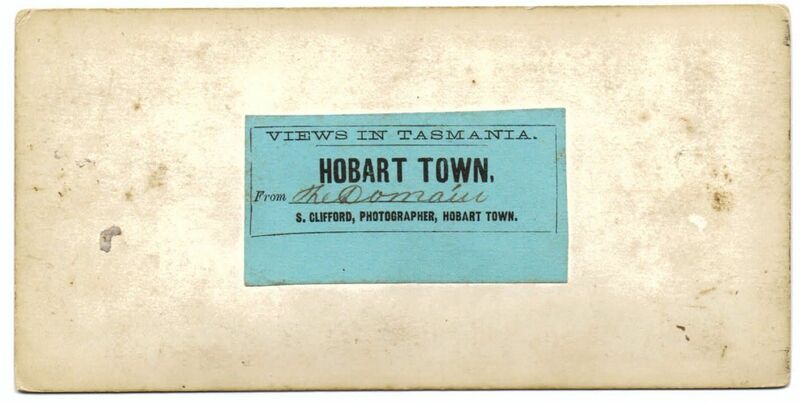 The verso carries Samuel Clifford’s printed label “Views in Tasmania, S. Clifford, Photographer, Hobart Town” and the hand-written title of this item – “The New Wharf”. The stamp on the verso carries a circle enclosing a cartoon of Romans receiving an award, framed by a Latin motto [?] beneath which is the wording “Medal Awarded to S. Clifford Intercolonial Exhib. Victoria 1866” and inside the ribbon above the stamp is printed “And Honourable Mention” . Below all this are the awards: New Zealand, 1865, Melbourne 1866, For Architectural & Landscape Photograph, Samuel Clifford, Liverpool Street, Hobart Town Tasmania”. 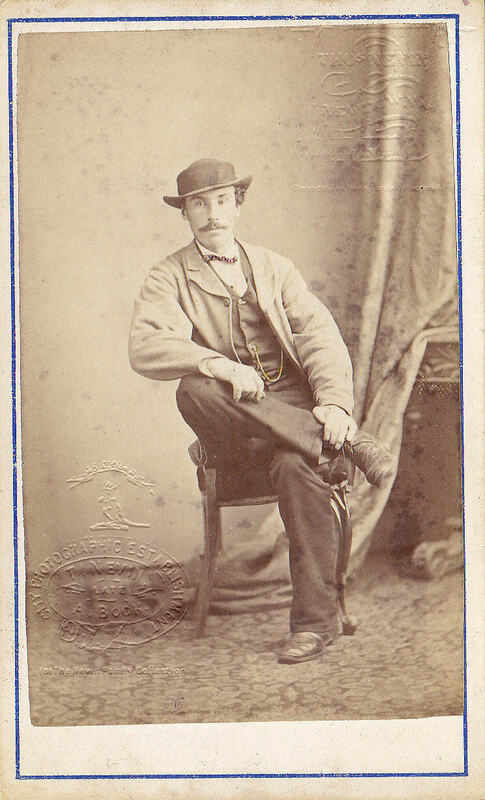 The stereograph therefore was taken or produced sometime after the last-mentioned award won at Melbourne in 1866. The stereograph therefore was taken or produced sometime after the last-mentioned award won at Melbourne in 1866. 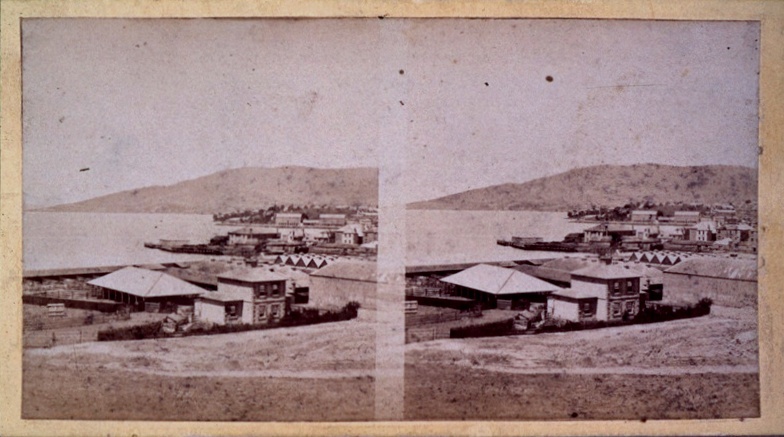 Above: Unlike the stereograph of New Wharf above, this is not a true stereograph because the two images are exactly the same. One single capture has been printed twice and overlaid one on the other at the centre where the wide opaque vertical line shows the overlay. The consumer of this item would have had a less than authentic stereographic viewing experience. Given the clarity of the print and its well-defined dark tones, it would have been printed from the single negative a decade or more after the original capture, and for the tourist trade, whereas the original photograph was taken for the Lands and Survey Department and the Hobart City Council who owned the slaughter yards, specifically for documentation of government assets. This view which Samuel Clifford’s studio titled “The Government Slaughter Yard &” appears in many collections: it was not only mounted on different coloured cards with square or arched frames, it was printed in deep black, white and grey tones, as well as with dark sepia and deep lilac fixer. Some of these extant examples were either labelled by Clifford or left blank. Some are attributed to Thomas Nevin, for example, the heavily coloured one held at the TMAG. Some were given new titles such as “Cattle Jetty Abbatoirs” or “Sandy Bay from the Domain” though not quite apposite, and yet others were included in what are known as the Clifford Albums at the State Library of Tasmania despite versions by other photographers and variations in the scene. Good condition. Possible reprint from Nevin’s original negative. 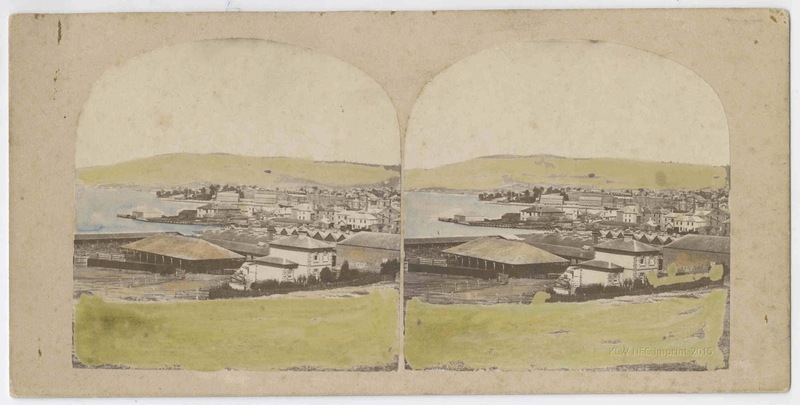 Unlike the stereograph of New Wharf above, this is not a true stereograph because the two images are exactly the same. One single capture has been printed twice and overlaid one on the other at the centre where the wide opaque vertical line shows the overlay. The consumer of this item would have had a less than authentic stereographic viewing experience. Given the clarity of the print and its well-defined dark tones, it would have been printed from the single negative a decade or more after the original capture, and for the tourist trade, whereas the original photograph was taken for the Lands and Survey Department and the Hobart City Council who owned the slaughter yards, specifically for documentation of government assets. This view which Samuel Clifford’s studio titled “The Government Slaughter Yard &” appears in many collections: it was not only mounted on different coloured cards with square or arched frames, it was printed in deep black, white and grey tones, as well as with dark sepia and deep lilac fixer. Some of these extant examples were either labelled by Clifford or left blank. Some are attributed to Thomas Nevin, for example, the heavily coloured one held at the TMAG. Some were given new titles such as “Cattle Jetty Abbatoirs” or “Sandy Bay from the Domain” though not quite apposite, and yet others were included in what are known as the Clifford Albums at the State Library of Tasmania despite versions by other photographers and variations in the scene. Publication Information: [Hobart : s.n., c1872][?]. The black and white print (above) from another negative which was taken from the same viewpoint of the same location, is identified at TAHO as the abbatoirs at Cattle Jetty, Queens Domain, but the date 1872 is incorrect. Because of the telegraph pole (?) now evident in the centre of the image, it was probably taken ca. 1880. Thomas Nevin would have taken the original photograph a decade earlier under commission as government contractor for the Lands and Survey Dept. of the HCC, and supplied the Council with prints in various formats including a stereograph and unmounted cdv, with at least one photograph printed verso with the Royal Arms insignia of his official government contract stamp. The hand-coloured stereograph to survive bears no stamp verso, which suggests it was randomly saved from the HCC archives, or even studio rejects, and subsequently coloured by family members of a commercial client. The same image mounted with squared corners was sold as a commercial item by Samuel Clifford’s when reprinted from Nevin’s original sometime before Clifford’s retirement in 1878. A print from the same negative is held at the State Library of Tasmania which ostensibly bears verso Samuel Clifford’s label, and the generic title “Sandy Bay … from the Domain“. 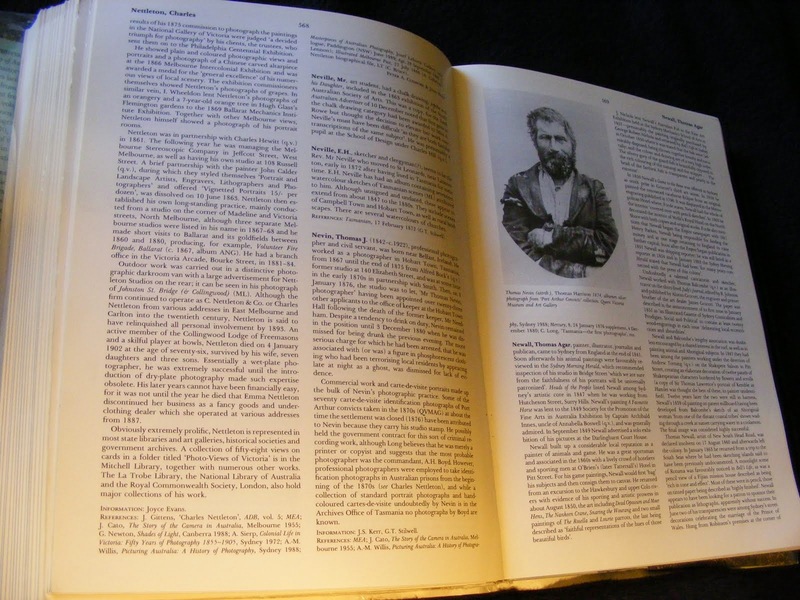 Without an online digital image of the verso, key information about the label and accession date cannot be verified. Samuel Clifford and Thomas J. Nevin collaborated on the production and reproduction of stereographs and studio portraits from the mid 1860s until Clifford retired in 1878, but whether this negative and stereograph format was produced as early as 1865, is open to question, as is the poor reproduction by the State Library of Tasmania, which leads the viewer to assume that lilac fixer was the dominant or preferred print tone of the photographer’s studio.